West Center grew over the years and 65 years ago the cornerstone for the Undercroft, known as Leath Hall and the first stage of the new building, was laid in 1952. As the membership increased, outgrowing Leath Hall, plans were made and funds were raised to build the present sanctuary, which was dedicated 55 years ago on Palm Sunday 1962. In the fall of 1997 the Dorothy Thomson Memorial Organ, a digital/pipe organ built by the Rodgers Instrument Company, was dedicated with a concert by Fred Swann, a renowned organist and former music director at West Center. With all these milestones, the church has many reasons to feel blessed and thankful in the coming year. Of course we will want to celebrate these 90 plus years and will be making plans in the next few months. If you are interested in helping with this or have ideas for a celebration, please let us know. West Center is celebrating a number of anniversaries starting with the founding of the church. The Sunday School started 105 years ago in September 1912 when a group of parents living in the Cedar Knolls and Armour Villa neighborhoods, concerned that their children and others have a proper religious education organized classes under the leadership of Allan Fullarton. In 1922, the church acquired the land at the corner of Pondfield Road West and Chatfield Roads, raised funds and built the community house which is the building currently housing the Bronxville Montessori School. 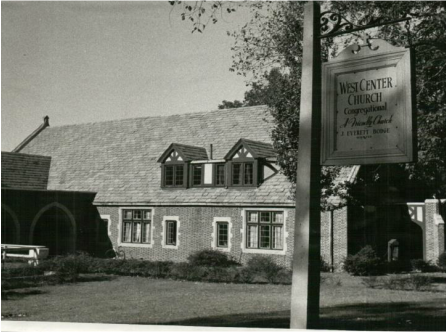 On June 13, 1927, West Center Congregational Church was formally organized and chose to affiliate with the Congregational denomination because of its service to the community and its emphasis on self-governance. Later that year, in October, West Center was admitted into the Association of Congregational Churches.